1961, The Beatles appeared at The Cavern Club, Liverpool, for the very first time (as The Beatles), they would go on to make a total of 292 other appearances at the Club. 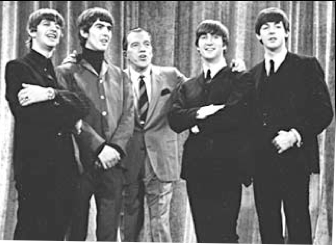 1964, The Beatles made their US live debut on CBS-TV's 'The Ed Sullivan Show'; they performed five songs including their current No.1 'I Want To Hold Your Hand' watched by an estimated 73 million people. The show had received over 50,000 applications for the 728 seats in the TV studio. 1967, Canadian conductor Percy Faith died aged 67. He scored the 1953 hit 'Song from the Moulin Rouge' and 1960 No.1 'Theme From A Summer Place', nine weeks at No.1, which won the Grammy Award for Record of the Year in 1961. 1968, Hal Cone former manager of The Monkees and Head of Jones Records was found guilty of theft, forgery, receiving stolen property and conspiracy. 1972, Paul McCartney's Wings played the first night of a UK College tour in Nottingham. The group arrived unannounced asking social secretaries if they would like them to perform that evening. The band's intended first stop on the tour, Ashby-de-la-Zouch, refused to allow them to play so they drove on to Nottingham. Admission was 40p, British pub rock band Brinsley Schwarz was the opening act for the tour. 1981, American singer Bill Haley was found dead, fully clothed on his bed at his home in Harlington, Texas from a heart attack, Haley had sold over 60 million records during his career. Scored the 1955 No.1 single 'Rock Around The Clock', and became known as the first Rock 'n' Roll star. Haley was blinded in his left eye as a child due to a botched operation and later adopted his distinctive spit-curl hairstyle to distract attention from his blind eye. 1982, George Harrison presented UNICEF with a check for $9 million, ten years after the fundraising concert for Bangladesh. 1986, Pete Townshend, Chrissie Hynde and The Communards played a charity show at London's Albert Hall for the victims of a volcanic eruption in Colombia. 1993, Mick Jagger solo album alert! The Rolling Stones singer releases Wandering Spirit. It peaks at No. 11 on the American album chart. 1993, Paul McCartney releases his solo album Off the Ground. 2004, One-time Supreme Diana Ross is convicted of driving while under the influence in Arizona, and is ordered to spend two days in jail. 2005, The Who's Roger Daltrey is made a Commander of the Order of the British Empire at Buckingham Palace. The rock gnome jokes the Queen would "probably fall off her podium if she heard The Who's songs."